OnePlus 2 smartphone is the successor of OnePlus One and it is a flagship killer. The device comes with 5.5 inch LTPS LCD touchscreen display, which is powered by 1.8 GHz cortex-A57 processor and it runs on Android 5.1 Lollipop operating system. 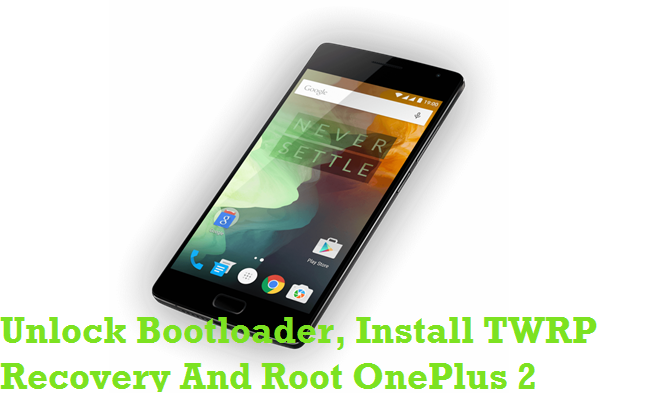 If you have purchased this smartphone and looking for a way to root it, well then you are in the right page as I have given a tutorial to root OnePlus 2 here by unlocking it’s bootloader. By following the tutorial given here, you will be able to unlock bootloader of you OnePlus 2 android device. Also, you will be able to install TWRP recovery in it as well. By rooting your smartphone, you will get the ability to install custom ROM firmware’s, remove pre-installed applications and do a lot more things. Step 1: Before getting started with a rooting procedure, it is always important to take a complete backup of personal data in your smartphone. So, take a backup of personal data in your OnePlus 2 smartphone first. Step 2: Next, you will need to enable USB debugging mode in your smartphone. To do that, first enable “Developer Options” in your device by following this path: Settings -> About Phone -> Build Number (tap on it for 5-7 times). Now to enable USB Debugging mode, follow this path: Settings -> Developer Options -> Android Debugging. Step 3: Now, download OnePlus 2 USB driver and install it in your computer. Only by doing so, you will be able to connect your OnePlus 2 smartphone with the computer successfully. Step 4: Make sure that you have deactivated or uninstalled antivirus programs in your computer as they have a habit of interrupting the rooting procedure. Also, ensure that your smartphone has at least 70% battery backup in it before getting started with the procedure. Once you finished all these tasks, you can move forward with the tutorials given below. 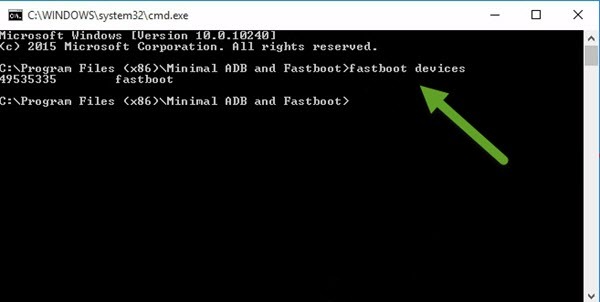 Step 1: To get started, download Minimal ADB and Fastboot and install it in your computer. 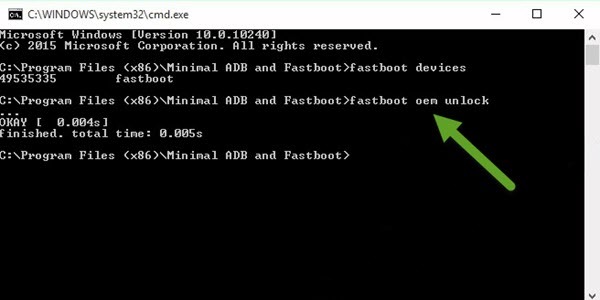 Once installed, launch the Minimal ADB and Fastboot command prompt window. Step 2: Next, switch off your smartphone and boot into the Fastboot mode by pressing the Volume Up and Powerkeys simultaneously for few seconds. 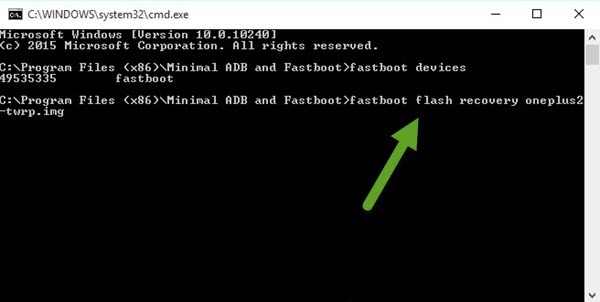 Step 4: If you have installed the USB driver of OnePlus 2, then your device will show up in Minimal ADB and Fastboot command prompt window as shown below. Step 5: If your device doesn’t show up in the command prompt window, then you need to disconnect it from computer, reinstall the USB driver and then connect again. 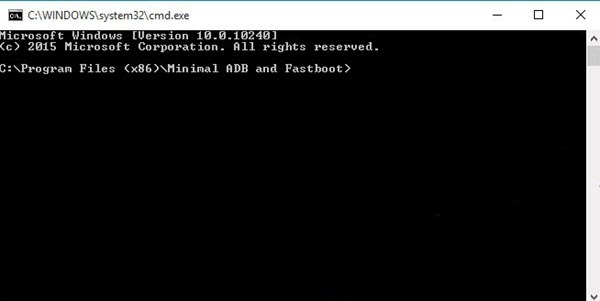 Step 7: Once you enter the above command, you will see the message “OKAY” in command prompt window which means your device’s bootloader is unlocked. That’s it. Now you have successfully finished unlocking the bootloader of OnePlus 2 Android smartphone. Now, let’s find out how to install TWRP recovery in OnePlus 2. Step 1: To get started, make sure that your smartphone’s bootloader is unlocked. Step 2: Next, download TWRP recovery for OnePlus 2 and move it into the folder of Minimal ADB and Fasboot (usually it will be C:\Program Files (x86)\Minimal ADB and Fastboot). 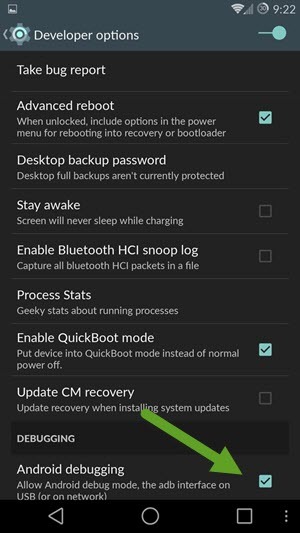 Step 3: Now, switch off your smartphone and boot it into the “Fastboot Mode” by pressing and holding the Volume Up and Power keys simultaneously for few seconds. Once your device boots into Fastboot mode, connect it to your computer using original USB data cable. Step 7: Once the flashing process is over, reboot your device. That’s it. Now you have successfully finished installing TWRP recovery in your OnePlus 2 smartphone. Now, let’s find out how to gain root privileges in your device. Step 1: To get started, download SuperSU (latest version) to your computer. 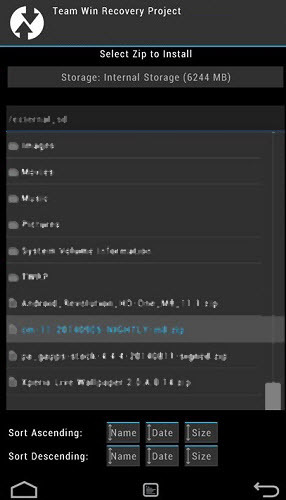 Once downloaded, connect your smartphone with the computer in USB debugging mode and transfer the SuperSU file to internal memory of your device. Once done, disconnect your smartphone from the computer. 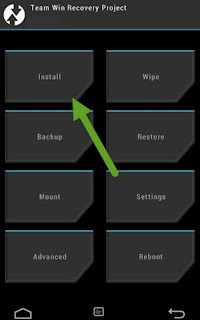 Step 2: Next, switch off your smartphone and boot into the TWRP recovery mode by holding and pressing the Volume Down and Power keys simultaneously. Once your device boots into the TWRP recovery, click on the “Install” button. Step 3: Now, select the SuperSU Zip package from your device’s internal memory to begin the flashing process. Step 4: Once the flashing process gets finished, you will get “Successful” message in TWRP recovery. Now, click on “Reboot System” to finish the rooting procedure. That’s it. Now you have successfully finished rooting OnePlus 2 Android smartphone. For confirmation, open up your Apps Menu and look for SuperSU app. If you can find it there, then the rooting process is successful. 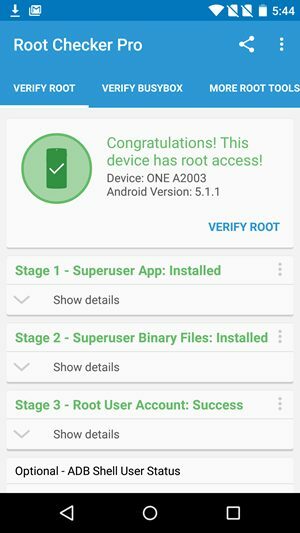 Alternatively, you can use the Root Checker from Google Play store to verify the root privileges of your smartphone. If you encounter any issues while following the tutorials given here, drop a comment below. I will get back to you with a solution!